This past Thursday, 8 September 2016, was the 50th Anniversary of International Literacy Day and Tim and I participated in the celebrations that were held in town. 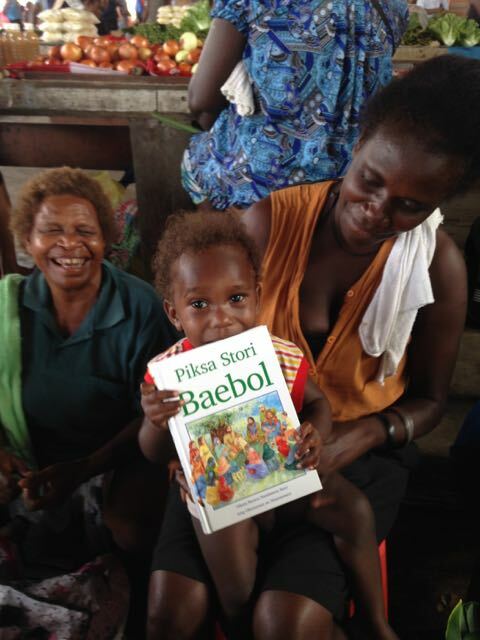 Years ago, when we first arrived in the Solomons, we helped organize some events for International Literacy Day. It’s gratifying today to see Solomon Islanders organize the event and our organization is invited by them to participate. Throughout the day, there were different events on the stage. 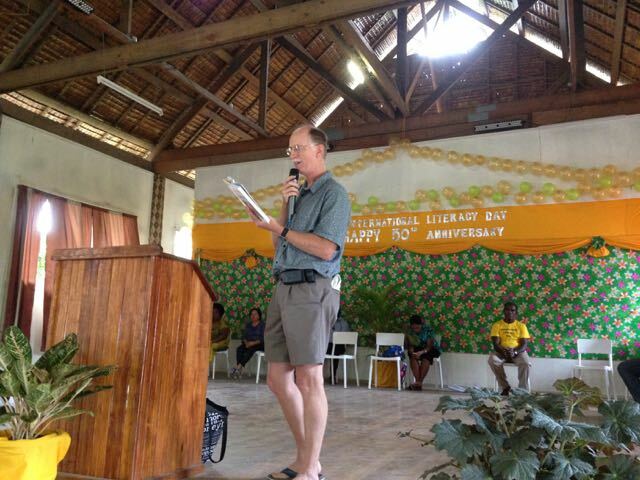 At one point Tim spoke to the audience about the importance of literacy in local languages and read a story from the Pijin Story Bible. 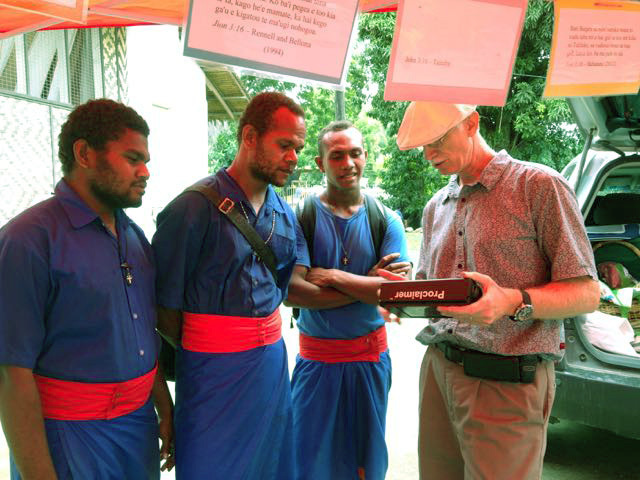 We had a display table covered with New Testaments and literacy materials produced in a variety of languages and a language map of the Solomon Islands. This year we had something new – audio recordings of Scriptures to share with people. The young man above is a Gela speaker. He was excited to see the Gela New Testament which was dedicated on May 1st this year. Then I pulled out my computer and played an audio file of the Christmas story from Luke in the Gela. You can see that he was mesmerized to hear the story of Christ’s birth in his own language. 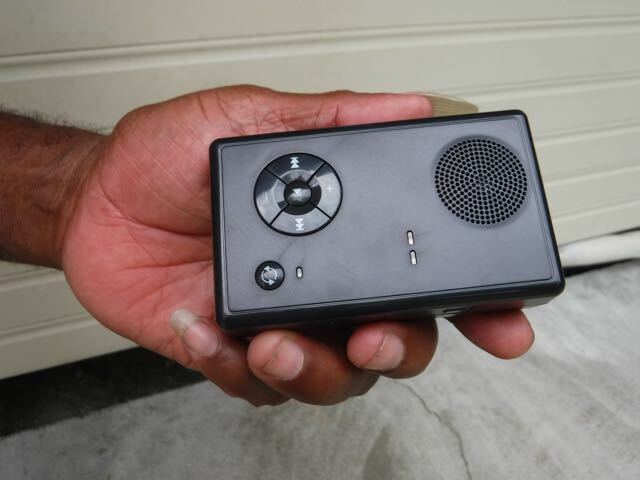 Recently we received some small recording devices that are loaded with the Owa New Testament. When an older Owa-speaking man came along, I started playing the ‘Proclaimer’ device and held it up so he hear it. He began listening, but as it began to sink in that he was listening to something in his own language, his facial expression changed to one of deep concentration. The words were meaningless to me, but the impact on this man was unmistakeable. As I watched his face, I could almost see the wheels turning in his brain as he processed what he was hearing. His eye brows knit together and then his head nodded slightly. It was amazing to see the muscles in his face shift and change as he continued to listen. I was so tempted to take a photo, I didn’t want to disrupt a sacred moment between this man and God’s Word. 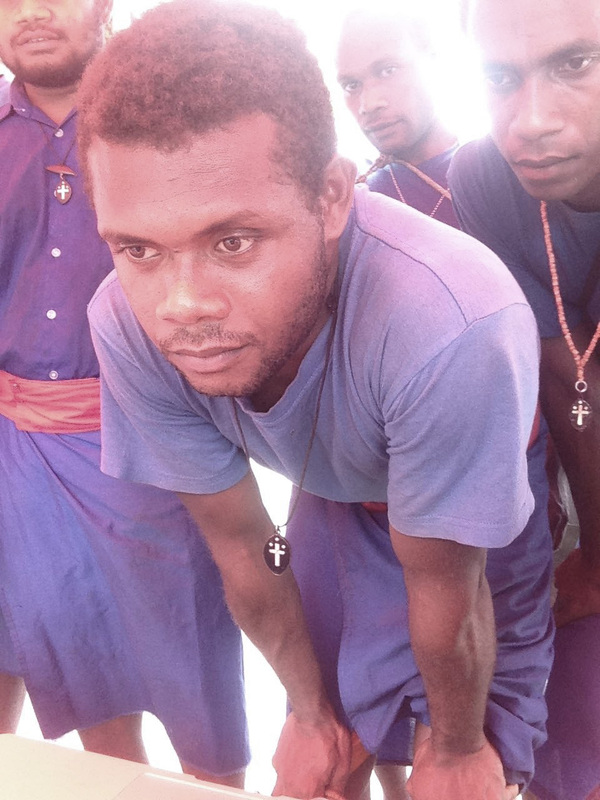 These young men serve with a religious order of the Anglican church and travel around the country ministering to people. Tim showed them this larger ‘Proclaimer’ with a recording of the Pijin New Testament. The young men were excited to hear about this tool and could see the potential benefit to their ministry. A young woman came and looked at the books on the table. One that caught her eye was a Pijin Bible Story book which she wanted to buy for the Sunday School at her church. On our way home, we stopped at the market. As we were walking through the market, we saw the woman who had bought the book and a small child holding it. While we were at the market, we started chatting with a woman who was selling tomatoes. She is a Sa’a speaker and we asked if she had a Sa’a New Testament. She said she didn’t, but was interested in purchasing one. Since we had a supply of New Testaments in the car, Tim was able to go find her a Sa’a New Testament and she happily purchased a copy. At the end of the day, we were really tired, but satisfied as well. We had opportunities to share about Bible translations, share audio Scripture recordings and talk to people who want to see a translation in their language.